Fan in compliance with EN 60335-2-80 5 (part 2), EN 68529, CE 107-53/1986, 0 marking standards. "Toxic" or "Noxious" large warning labels (to specify with your order). 3 retention shelves adjustable in height with rack system. Removable retention tank at the bottom of cabinet (100 mm height). Integrated electric fan: 220 volts - 0,1 A - 18 W; flow 90 m3/h; IPX4 protection; sound level 37,5 Lp dB(A) (3m). Double handling doors with 3 points key-locking system. Additional retention shelf in PCV. 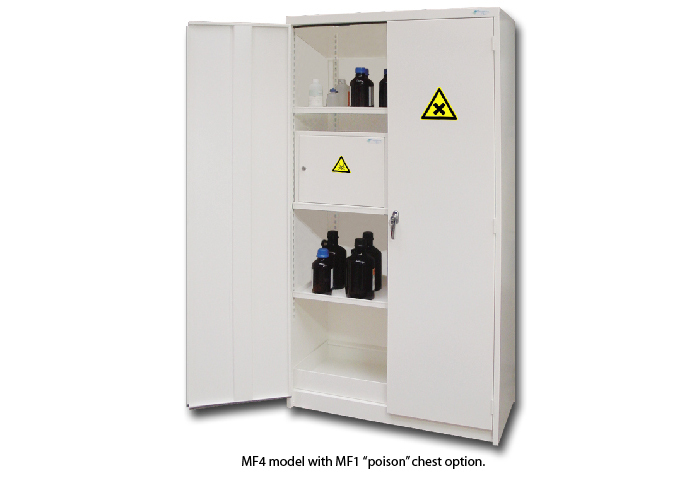 Can be used as wall mounted cabinets to store dangerous products or as poison chest in your safety cabinet ref MF4. "Toxic" warning label in compliance with ISO 3864, 92/58/CEE European directive and NF X08.003 norm. 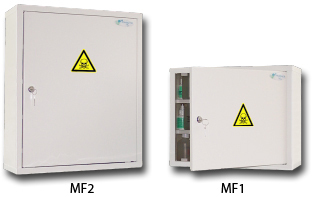 Shelves adjustable in height: 2 units for the model MF1 and 4 for the model MF2. Handling door with key-locking system. Possibility to fix on the wall. Possibility to connect 2 models.